How did my college football predictions do in 2014? Here, I look at not only my posted numbers for all games but also the forecasts made on this site and other outlets such as Grantland, Deadspin and Bleacher Report. It’s 2015, and I’m making a full effort to track and report on all of my predictions. It started with baseball this spring, and it will continue through football and basketball. Before the BCS title game, I wrote on Deadspin about how Ohio State presented a terrible match up for favorite Oregon. Ohio State had a vicious rushing attack that had just mauled a strong Alabama defense. Oregon had an average rush defense. During the game, Ohio State RB Ezekiel Elliott gashed Oregon for 246 yards on 36 carries (6.8 yards per carry). Despite 4 turnovers, Ohio State won 42-20. It is the start of the fourth, and it is creepy how on point your predictions are. Two of my preseason predictions make honorable mention. Auburn had a dream season in 2013, as they rose from the ashes of the SEC West to win the conference and play in the BCS championship game. However, they got the benefit of a few lucky plays (a tipped hail mary completion against Georgia, a field goal returned for a touchdown against Alabama). In August, I wrote about how Auburn would have a tough 2014 season because of their schedule and the small chance they benefit from those lucky type plays again. Auburn fans didn’t like that I called them lucky. @thepowerrank Luck? Really? You wanna talk about "luck". You are "lucky" to have a job writing about sports. Lazy journalism. Auburn couldn’t reproduce those plays in 2014. After a magical 12-2 season in 2013, they fell to 8-5 last season. Part of their demise was a tough cross division game at Georgia that they lost. My other favorite preseason prediction was that TCU would win the Big 12. I actually went against my numbers on this one as Oklahoma had a higher win probability. However, no one gave TCU a chance, and I had them ranked 14th in the preseason. TCU had a tremendous season as they went 12-1 and finished as co-champions with Baylor of the Big 12. Grantland asked me to predict the Heisman winner during the preseason. I don’t make player predictions, so I had some fun and picked Stanford QB Kevin Hogan. I thought I had some strong reasoning, but Hogan came no where near the Heisman conversation. He led a Stanford offense that made red zone stalls a season long habit. This led to a disappointing 8-5 season. Halfway through the season, Grantland gave me a do over and asked for another Heisman prediction. This time I go with Bo Wallace, the quarterback of a 6-0 Ole Miss team. Part of my reasoning was his improved completion percentage the first half of the season, an oh so huge sample size to make a judgment. I wrote the following about my Wallace pick. It’s hard to deny a blond quarterback from an unexpected SEC contender. Then Wallace had a terrible second half of the season. He couldn’t make a play in a close game against LSU, and Ole Miss lost their first game of the season. The once mighty Rebels lose two more SEC games before getting blown out by TCU 42-3 in a bowl game. Don’t ask me about the Heisman. For predictions based on my numbers, I was disappointed to not predict Ohio State’s surge at the end of the season. Before the Big Ten title game, they were 13th in my team rankings. Their loss to a bad Virginia Tech team at home pulled them down. Then Ohio State plays the 3 best games any college football team has ever put together. They become the first national champion in the playoff era. Members get access to my best predictions for spreads and totals. The member predictions with the most value are the college football totals, which were posted from week 6 to the end of the season in 2014. These predictions went 53.3% against opening totals (273-239-4) and 51.5% against closing totals (260-245-9). However, these numbers do not tell the entire story. When the predicted total differed from the opening total by more than 4 points, the market total moved in the direction of the prediction 90.4% of the time (122-13, with two totals that didn’t move). On average, the final total moved 3.5 points in the direction of the model prediction. Some refer to this as closing line value. For the entire 2014 season, spread predictions for members were 50.1% against the opening line (367-366-19) and 48.6% against the closing line (357-378-8). Modifications will be made to this model for 2015. To learn more about becoming a member of The Power Rank, click here. On the predictions page, I posted a margin of victory for each college football game. These predictions got the game winner correct in 70.4% of games (539-227). It’s interesting that my preseason model, which doesn’t use data from the regular season, predicted a higher percentage of game winners (71.1% on 482-196 with no predictions on the other games). Against the markets, the public predictions won at 49.9% against the opening line (370-371 with 18 pushes) and 48.5% against the closing line (363-385 with 9 pushes). It’s tough to beat the markets on every game. The public predictions will be reworked this season. There’s room for great improvement, especially since these predictions were 53.8% against the opening spread through week 8 of the season. On Bleacher Report, I predicted which teams would make the four team playoff based on the committee rankings. To learn more about these simulation methods, click here. Overall, I thought the predictions did pretty well. Mississippi State was first in the committee’s first rankings. However, my numbers thought they wouldn’t make it due to tough games at Alabama and Ole Miss. Mississippi State lost both games and didn’t make the playoff. By week 12 of the season, Alabama, Oregon and Florida State had the highest chance to make the playoffs by my calculations. Eventually, all 3 of these teams made the playoff. However, the predictions were off the last week of the season as my numbers had TCU instead of Ohio State for the last spot. As I mentioned earlier, it was difficult to predict Ohio State’s surge at the end of the season based on their previous numbers. However, my methods also need work. I had no way of knowing how the committee would value a conference championship. For 2015, I’ll account for this in my model. Even with this improvement, there are still human factors out of my control. Though the committee placed an emphasis on a conference championship, Big 12 commissioner Bob Bowlsby still presented them with co-champions in Baylor and TCU. It might make more sense to crown Baylor the champion as they beat TCU. Some of my other predictions had the right idea but didn’t nail it. Before their October 18th game, I predicted neither Florida State nor Notre Dame would make the playoff despite their undefeated records. Notre Dame fell off a cliff after losing the game. However, Florida State won close game after close game to make the final 4. I would definitely make the same prediction again. I had my doubts whether Chris Peterson could bring his success at Boise State to Washington. Boise State had a long history of winning which transcended Petersen’s time as coach. 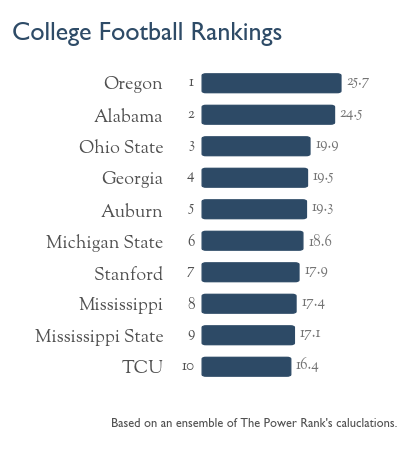 Washington went 8-6 in 2014 with a rank of 40th in The Power Rank. However, the jury is still out on this one. In the preseason, my numbers gave Wisconsin the best chance to win the Big Ten. They weren’t better than Ohio State but had a favorable schedule. Ohio State stomps them in the Big Ten title game on their way to a national title. How safe is Oregon from an upset against Ohio State? 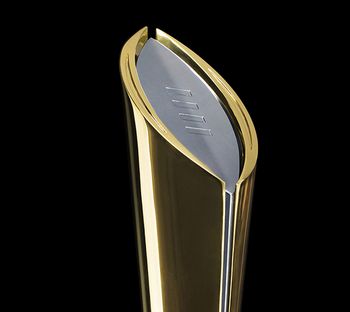 Oregon looks like a clear favorite over Ohio State in the college football championship game. The markets opened with Oregon as a 7 point favorite, which implies a 70% win probability. The predicted margin of victory is even higher with my college football team rankings based on margin of victory. After an early loss to Arizona, Oregon has been dominant. Only UCLA has come within two touchdowns of beating Oregon. This stretch of games included a rematch against Arizona and the playoff semi-final against Florida State. Ohio State barely made the college football playoff after an early loss to Virginia Tech, a team that went 3-5 in the ACC. They’re playing a third string quarterback lucky to have receivers talented enough to catch his jump balls. In reality, Ohio State is a terrible match up for Oregon. Let me explain. Ohio State has an elite ground game. To quantify this, let’s look an efficiency statistic: yards per carry. In college football, sacks count as rushes in the official statistics. Since sacks are pass plays, I exclude these plays in calculating yards per carry. To adjust yards per carry for strength of schedule, I use a ranking algorithm I developed based on my research in statistical physics. While Ohio State has the 7th best raw yards per carry, these adjustments move them up to first. Ohio State is predicted to gain 6.78 yards per carry against an average FBS rush defense. And Oregon has essentially an average rush defense (52nd of 128). Ohio State ran all over Wisconsin (13th ranked rush defense) and Alabama (2nd). They should do even better against Oregon. The visual shows the difficult match up for Oregon. The blue dots represent Ohio State’s pass and rush offense. The smaller green dots show Oregon’s defense, and better defenses appear further to the right to facilitate comparisons. You’re looking at how a unit compares to average. The gap between Ohio State’s rush offense and Oregon’s rush defense shows the clear advantage for the Buckeyes. They will give most of the carries to Ezekiel Elliott, who has gained 6.9 yards per carry this season. We all saw his speed when he outran the Alabama defense for a 85 yard touchdown in the semi-final game. Quarterback Cardale Jones will also run the ball, and he’s a load to bring down at 6’5″, 250 pounds. Offensive line coach Ed Warriner deserves much of the credit for Ohio State’s explosive run game. He had to groom four new starters this year, and none of the candidates had 5 star recruiting credentials. While the offensive line came into the season with question marks, it now looks like the strength that could carry them past Oregon. Oregon, led by Heisman winning quarterback Marcus Mariota, excels at throwing the ball. To quantify this, let’s look at yards per pass attempt, an efficiency statistic that includes sacks. After adjusting for schedule, Oregon has the top ranked pass offense. They are predicted to throw for 9.04 yards per attempt against an FBS average pass defense. However, Ohio State’s strength on defense is against the pass. They had the 9th best pass defense by adjusted yards per attempt. Against Alabama, they didn’t allow star receiver Amari Cooper to make big plays. While Cooper averaged 13.9 yards per catch this season, his longest against Ohio State was 15 yards. The visual shows how Oregon’s offense matches up with Ohio State’s defense. The gap between Oregon’s offense and Ohio State’s defense shows the size of the advantage. Oregon should still be able to throw the ball against Ohio State. However, it won’t be as easy as against Florida State. The visual also show Oregon’s edge in running the ball. They should run it often (and they did on 55.9% of plays this season) and set up play action for Mariota. For college and pro football this season, I started aggregating many predictions into one ensemble prediction. This ensemble, which includes my adjusted numbers and data from the markets, predicts Oregon by 3.2 points, which corresponds to a 59.5% win probability. However, you should never blindly trust numbers, especially in a game with mismatches. One of the predictors in the ensemble accounts for passing and rushing separately for each team. It considers Ohio State’s significant edge in running the ball and that Ohio State runs the ball on 59.3% of plays. This matchup model predicts a 50-50 game between Ohio State and Oregon. I think the game will be very close. Can Mariota have a monster game and carry his team? Or does Elliott break off big run after big run? This game most likely comes down to a field goal in the final minutes. 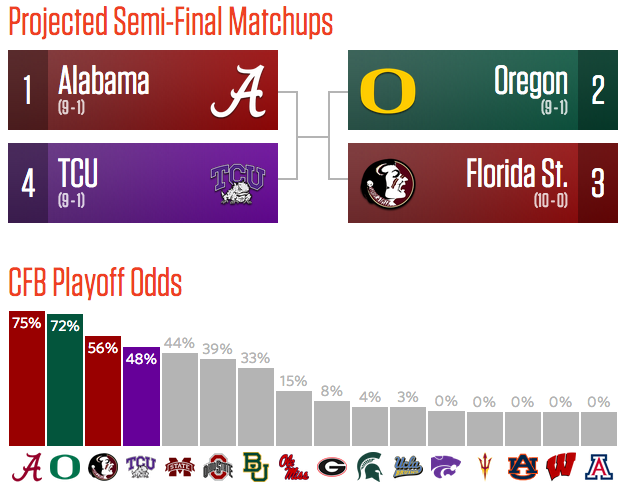 I give a slight edge to Oregon to win, but don’t be surprised if Ohio State pulls it out. 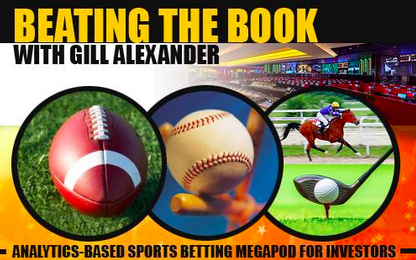 Gill Alexander had me on his Beating the Book podcast to talk college football bowl games. Taping a podcast with Gill is always fun. He puts in a ton of time both before and after the recording to make the podcast awesome. Mike Craig, my partner in the college football prediction service, is also a guest on the podcast. To stream it on your computer, click here. 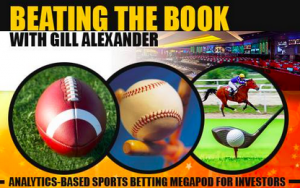 The Beating the Book podcast is also available on iTunes. Be sure to check out his NFL MegaPods during this year’s playoffs. You want to know which teams will win a bowl game. A predicted margin of victory would also help with your bowl pool. 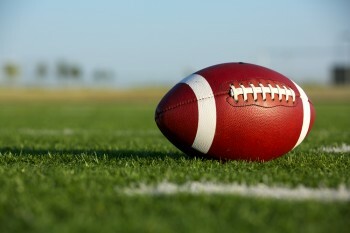 The Power Rank’s bowl predictions are based on aggregating a number of different predictions. These ensemble predictions should outperform the prediction from any single method. The first predictor comes from my team rankings, the first calculations on this site. After developing a ranking algorithm based on the mathematics of randomness, I applied it to margin of victory in football games. The method accounts for strength of schedule and devalues the effect of blow outs. Now, I also apply the ranking algorithm to yards per play to rank offenses and defenses. This gives an alternative perspective on teams immune from the randomness of turnovers. The ensemble also considers my preseason rankings. It might seem silly to use such dated calculations. However, team strength tends to persist from season to season. From 2005 through 2013, the higher ranked team in the preseason rankings have won 60.3% of bowl games, almost as good as the 62.3% accuracy of the team rankings. The ensemble predictions below aggregate my predictions from these three sources. You might have the time to watch all 39 post season college football games, but probably not. Which games should you choose? The predictions below rank bowl games based on two criteria. First, the game rankings consider the strength of the two teams. You’d rather watch Alabama and Ohio State than Utah State and UTEP. The second criteria for the game rankings is closeness of the outcome as estimated by the ensemble predictions. Arizona and Boise State might not be top 10 teams, but my methods predict a 50-50 game that might be decided by single play. That makes it worth tuning into the Fiesta Bowl. The number next to each team gives their rank in my ensemble rankings. The top ten teams are shown in the visual at the top of this article. 1. Mississippi versus TCU at a neutral site. Mississippi (8) will beat TCU (10) by 1.0 at a neutral site. TCU has a 47% chance of beating Mississippi. 2. Ohio State versus Alabama at a neutral site. Alabama (2) will beat Ohio State (3) by 4.5 at a neutral site. Ohio State has a 37% chance of beating Alabama. 3. Kansas State versus UCLA at a neutral site. Kansas State (12) will beat UCLA (17) by 1.6 at a neutral site. UCLA has a 45% chance of beating Kansas State. 4. Michigan State versus Baylor at a neutral site. Michigan State (6) will beat Baylor (13) by 4.5 at a neutral site. Baylor has a 37% chance of beating Michigan State. 5. Oklahoma versus Clemson at a neutral site. Oklahoma (15) will beat Clemson (21) by 2.7 at a neutral site. Clemson has a 42% chance of beating Oklahoma. 6. Boise State versus Arizona at a neutral site. Arizona (31) will beat Boise State (32) by 0.1 at a neutral site. Boise State has a 50% chance of beating Arizona. 7. Arkansas versus Texas at a neutral site. Arkansas (24) will beat Texas (29) by 1.2 at a neutral site. Texas has a 47% chance of beating Arkansas. 8. West Virginia versus Texas A&M at a neutral site. West Virginia (20) will beat Texas A&M (28) by 2.6 at a neutral site. Texas A&M has a 42% chance of beating West Virginia. 9. Nebraska versus USC at a neutral site. USC (18) will beat Nebraska (27) by 3.6 at a neutral site. Nebraska has a 39% chance of beating USC. 10. Auburn versus Wisconsin at a neutral site. Auburn (5) will beat Wisconsin (19) by 7.7 at a neutral site. Wisconsin has a 28% chance of beating Auburn. 11. Florida State versus Oregon at a neutral site. Oregon (1) will beat Florida State (11) by 10.8 at a neutral site. Florida State has a 22% chance of beating Oregon. 12. Notre Dame versus LSU at a neutral site. LSU (14) will beat Notre Dame (34) by 6.5 at a neutral site. Notre Dame has a 32% chance of beating LSU. 13. Boston College versus Penn State at a neutral site. Penn State (40) will beat Boston College (47) by 1.1 at a neutral site. Boston College has a 47% chance of beating Penn State. 14. Mississippi State versus Georgia Tech at a neutral site. Mississippi State (9) will beat Georgia Tech (30) by 8.6 at a neutral site. Georgia Tech has a 26% chance of beating Mississippi State. 15. Miami (FL) versus South Carolina at a neutral site. Miami (FL) (16) will beat South Carolina (35) by 6.9 at a neutral site. South Carolina has a 30% chance of beating Miami (FL). 16. Utah versus Colorado State at a neutral site. Utah (36) will beat Colorado State (48) by 2.6 at a neutral site. Colorado State has a 42% chance of beating Utah. 17. Brigham Young versus Memphis at a neutral site. Brigham Young (42) will beat Memphis (51) by 1.6 at a neutral site. Memphis has a 45% chance of beating Brigham Young. 18. Iowa versus Tennessee at a neutral site. Tennessee (46) will beat Iowa (53) by 1.5 at a neutral site. Iowa has a 45% chance of beating Tennessee. 19. Cincinnati versus Virginia Tech at a neutral site. Virginia Tech (38) will beat Cincinnati (52) by 3.0 at a neutral site. Cincinnati has a 41% chance of beating Virginia Tech. 20. East Carolina versus Florida at a neutral site. Florida (25) will beat East Carolina (44) by 5.3 at a neutral site. East Carolina has a 35% chance of beating Florida. 21. Georgia versus Louisville at a neutral site. Georgia (4) will beat Louisville (33) by 11.5 at a neutral site. Louisville has a 20% chance of beating Georgia. 22. Missouri versus Minnesota at a neutral site. Missouri (22) will beat Minnesota (43) by 6.3 at a neutral site. Minnesota has a 32% chance of beating Missouri. 23. Oklahoma State versus Washington at a neutral site. Washington (39) will beat Oklahoma State (55) by 3.0 at a neutral site. Oklahoma State has a 41% chance of beating Washington. 24. Rutgers versus North Carolina at a neutral site. North Carolina (63) will beat Rutgers (65) by 1.1 at a neutral site. Rutgers has a 47% chance of beating North Carolina. 25. Arizona State versus Duke at a neutral site. Arizona State (26) will beat Duke (60) by 7.8 at a neutral site. Duke has a 28% chance of beating Arizona State. 26. North Carolina State versus UCF at a neutral site. UCF (37) will beat North Carolina State (64) by 6.0 at a neutral site. North Carolina State has a 33% chance of beating UCF. 27. Illinois versus Louisiana Tech at a neutral site. Louisiana Tech (59) will beat Illinois (70) by 3.1 at a neutral site. Illinois has a 41% chance of beating Louisiana Tech. 28. Navy versus San Diego State at a neutral site. Navy (69) will beat San Diego State (73) by 1.3 at a neutral site. San Diego State has a 46% chance of beating Navy. 29. Maryland versus Stanford at a neutral site. Stanford (7) will beat Maryland (56) by 15.8 at a neutral site. Maryland has a 13% chance of beating Stanford. 30. Western Michigan versus Air Force at a neutral site. Western Michigan (71) will beat Air Force (79) by 1.0 at a neutral site. Air Force has a 47% chance of beating Western Michigan. 31. Houston versus Pittsburgh at a neutral site. Pittsburgh (41) will beat Houston (67) by 6.0 at a neutral site. Houston has a 33% chance of beating Pittsburgh. 32. Central Michigan versus Western Kentucky at a neutral site. Western Kentucky (75) will beat Central Michigan (85) by 2.4 at a neutral site. Central Michigan has a 43% chance of beating Western Kentucky. 33. Toledo versus Arkansas State at a neutral site. Toledo (74) will beat Arkansas State (87) by 2.7 at a neutral site. Arkansas State has a 42% chance of beating Toledo. 34. Marshall versus Northern Illinois at a neutral site. Marshall (23) will beat Northern Illinois (80) by 13.8 at a neutral site. Northern Illinois has a 16% chance of beating Marshall. 35. Fresno State versus Rice at a neutral site. Rice (91) will beat Fresno State (95) by 1.7 at a neutral site. Fresno State has a 45% chance of beating Rice. 36. Nevada versus Louisiana Lafayette at a neutral site. Nevada (76) will beat Louisiana Lafayette (94) by 5.5 at a neutral site. Louisiana Lafayette has a 34% chance of beating Nevada. 37. South Alabama versus Bowling Green at a neutral site. Bowling Green (97) will beat South Alabama (109) by 1.8 at a neutral site. South Alabama has a 45% chance of beating Bowling Green. 38. Utah State versus UTEP at a neutral site. Utah State (54) will beat UTEP (115) by 16.1 at a neutral site. UTEP has a 13% chance of beating Utah State. These ensemble predictions are different from those that I’ve posted this season on the blog. Those sample predictions each week also incorporated data from the betting markets. These enhanced ensemble predictions, which we use to make picks for spreads and totals, are available members. To learn about becoming a member, click here.